Food is essential for providing our bodies with sustenance, and eating is also great source of pleasure. Unfortunately, not everything that tastes good is good for you. This is particularly true when it comes to the health of your smile. Our dentist in Havre de Grace realizes that the holiday season isn’t the easiest time of year to avoid sugary treats. From Halloween through Christmas, cookies, cake, and candy are everywhere. Tooth decay is caused by bacteria that feed on the plaque and food particles in your mouth. When it comes to damaging your teeth, not all sweets are created equal. For example, although chocolate is loaded with sugar, it’s not as harmful as other sweets because it rinses away easily and doesn’t stick to your teeth. The three types of candy that are most harmful to your smile are sour candy, hard candy, and sticky candy. Sour candy attacks your teeth in two ways. The acid in the candy breaks down your enamel, and the sugar feeds the bacteria that causes cavities. 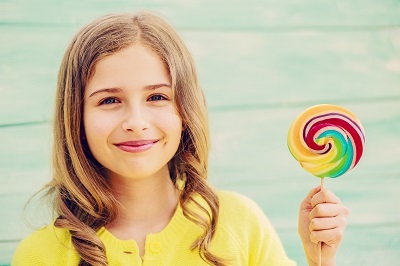 Both hard candy and sticky candy stick do additional damage to your smile because they stick to your teeth as they slowly dissolve. During this time, they break down the enamel in your teeth, allowing bacteria to get inside your teeth and cause cavities. Starchy foods like white bread, pasta, and potato chips begin to convert into sugar as soon as they mix with the saliva in your mouth. These foods can easily become lodged between your teeth where they feed the bacteria that attacks your smile. After you eat these foods, make sure to drink lots of water to help rinse your smile clean. It’s also important to floss regularly to remove the starchy particles left between your teeth. Whether you call it pop or soda, there’s a well established body of research which demonstrates the devastating effects that carbonated soft drinks have on your smile. Soda conducts a two-pronged attack on your smile: First, the citric acid and phosphoric acid in the soda extract essential minerals from your enamel. Then, the sugar in these drinks feed the bacteria that causes cavities. It’s recommended to avoid all soft drinks, including sugar-free soft drinks, as they can cause serious damage to your smile. Sports drinks are advertised as a way to replenish what your body loses during a workout — electrolytes and carbohydrates. Unfortunately, sports drinks are highly acidic. This acid erodes the enamel in your smile and the sugar will help cause cavities. Family, Implant and Reconstructive Dentistry offers a full array of dental services for you and your family in Havre de Grace. Call today to schedule your next checkup. You can also find out how our services such as veneers and dental implants can brighten up your smile.